By Miriam Valverde on Wednesday, August 16th, 2017 at 10:00 a.m.
President Donald Trump calls out the KKK, neo-Nazis and other hate groups in condemning violence in Charlottesville, Va. on Aug. 12, 2017. A deadly attack in Charlottesville, Va., during a white nationalist rally and counterprotests brought attention to far-right terrorism and how it compares with radical Islamic terrorism. President Donald Trump, always quick to denounce radical Islamic terrorist attacks, was widely criticized for taking longer to explicitly condemn white nationalists. After first criticizing actions on "many sides," Trump finally gave a full-throated condemnation two days later. The day after that, he said he thought "there is blame on both sides." During the Aug. 12 protests, the driver of a Dodge Challenger drove into a crowd of people. Heather D. Heyer, 32, was killed and at least 19 others were injured, said a statement from the city government. Authorities charged a 20-year-old man from Ohio, James A. Fields Jr., with second-degree murder. The attack met the legal definition of domestic terrorism, said Attorney General Jeff Sessions in an interview with ABC News. After the Charlottesville events, we wondered about the latest numbers on domestic terrorism. How many attacks have there been, and who caused them? Most of the attacks were carried out by far-right violent extremists. But more people died during attacks connected with Islamic jihadist extremists. Violent extremism is generally defined as supporting or committing violent acts to achieve political, ideological, religious or social goals, said an April 2017 report from the U.S. Government Accountability Office. Perpetrators of violent extremism include white supremacists; anti-government groups; groups with extreme views on abortion, animal rights, the environment or federal ownership of public lands; and radical Islamist entities, such as the Islamic State of Iraq and Syria (ISIS). The 9/11 terrorist attacks resulted in the largest number of deaths in the United States caused by violent extremism, the GAO report said. About 3,000 people were killed in the attacks. 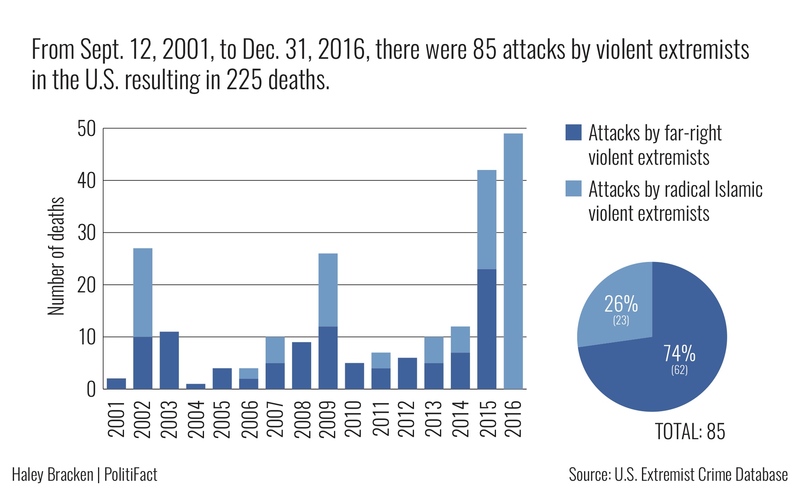 Since then — from Sept. 12, 2001, to Dec. 31, 2016 — there have been 85 attacks in the country by violent extremists resulting in 225 deaths. GAO reported citing data from the U.S. Extremist Crime Database. • The number of people killed in a given year ranged from one to 49. The think tank New America has compiled information on terrorist activities in the United States after 9/11. It details data on deadly attacks by ideology up to the Aug. 12, 2017 Charlottesville attack. Here’s their breakdown on the number of deaths caused by individuals of different ideologies: 95 by jihadist, 68 by far-right, and eight by black separatist/national/supremacist. Even individuals who carry out jihadist attacks, however, are sometimes American citizens or longtime residents. "The terrorist threat in the United States is almost entirely homegrown, as no foreign terrorist organization has successfully directed and orchestrated an attack in the United States since 9/11," said Albert Ford, a program associate with the International Security and Fellows programs at New America. Of 418 individuals tracked by New America who are accused of jihadist terrorism related crimes in the United States since 9/11, 85 percent of them were either U.S. citizens or U.S. legal residents, and about half were born American citizens, Ford said. Until the Orlando nightclub shooting, "the number of deaths caused by far-right-wing attacks outnumbered those caused by jihadism-related attacks," Ford said. The federal government has taken steps to address national threats from all groups by creating an interagency Countering Violent Extremism task force, GAO reported. Cornell Law School, 18 U.S. Code § 2331 - Definitions, "domestic terrorism"